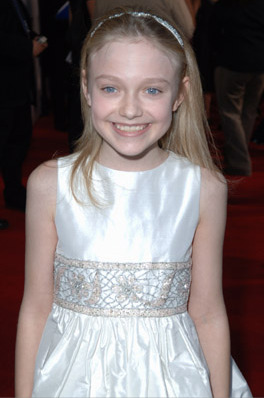 Hannah Dakota Fanning was born on the 23rd of February 1994, in Conyers, Georgia, USA. Before her debut into the cinematic world, Dakota did her own acting around her house. She was very active for her age, and often put a blanket under her shirt and pretended to be having a baby, using her younger sister, who is also an actress now, Elle, as the baby. Dakota went to a playhouse near her home, where the children that attended put on a play every week to show to their parents. But the people running the playhouse noticed that Dakota stood out, and advised her parents, Joy and Steve Fanning, to take her to an agency. They believed that she was extremely talented. But Dakota's big break-through was yet to come. She auditioned for one of the main characters in _I am Sam (2001)_ , and the director and the rest of the crew were amazed by her extraordinary talent. Dakota was cast, and starred in the movie as Lucy Diamond Dawson, alongside major Hollywood stars Sean Penn and 'Michelle Pfiefer' . After _I am Sam_(2001)_ her talent was immediately recognized around the world. She went straight onto Trapped (2002) as Abby Jennings, alongside Charlize Theron, then played the younger version of Reese Witherspoon in 2002's Sweet Home Alabama (2002) But Dakota still had two more movies to come in 2002. Firstly she got a huge role in Steven Spielberg's _"Taken" (2002) (mini)_ , the mini-TV series, and narrated the ten whole episodes, as well as having a part. This was a little more challenging, as she was playing a troubled alien child, but she managed to do brilliantly. Her last movie for 2002 was the children's movie _Hansel and Gretel (2002)_ as Katie. 2003 was also a brilliant year for Dakota, as she starred in a number of exciting projects. Firstly, it was as Sally Walden in _The Cat in the Hat (2003)_ with Mike Myers, then she played Lorraine "Ray" Schleine, a bratty little girl, in the sweet comedy Uptown Girls (2003) alongside Brittany Murphy. She then voiced preschool Kim in Kim Possible: A Stitch in time. First in 2005 was Nine Lives (2005), as Maria, then the chilling Hide and Seek (2005) alongside Robert DeNiro. By now, she was the busiest child actress in Hollywood, with a resume to die for. Her younger sister, Mary Elle Fanning (Elle), had also been discovered a few years earlier. After Hide and Seek came War of the Worlds (2005), which was one of her major movies out of everything she'd worked in. Not only did it make her more popular, but she got to play the daughter of A-list Hollywood actor Tom Cruise. They had four very successful premieres; the first in Tokyo, Japan, the second in France, the third in London, England and the fourth in New York, USA. The reviews were outstanding, especially Dakota's. She then voiced Lilo in _Lilo and Stitch 2: Stitch has a Glitch (2005)_ , which she has just completed.